Bala, from village Faiz Alipur Majra Village has two sons and a daughter. Her husband used to earn a meager subsistence wage, as a day labourer. The family was so poor that often a meal was missed due to lack of money. However, Bala decided to struggle and strive for a better life. She persuaded her husband to learn masonry skills and he became a good mason. Then she became a member of the Puja Self Help Group formed by Arpana in her village. Despite her in-laws not wanting Bala to work, she went to work as a daily wage labourer.She began depositing regular savings, as advised by her group members, first with just Rs.20 to 50 a month to now over Rs.500 a month. Geeta was married to Gopi of village Dhakwala, 11 years ago. She and Gopi had a happy life with 2 son’s and daughter. Geeta became a member of the self help group formed by Arpana in village Dhakwala, 2 years ago. In 2018, storm clouds gathered over her happy home with Gopi consorting with another woman. He frequently beat Geeta and in this period and turned her out on the street at night. 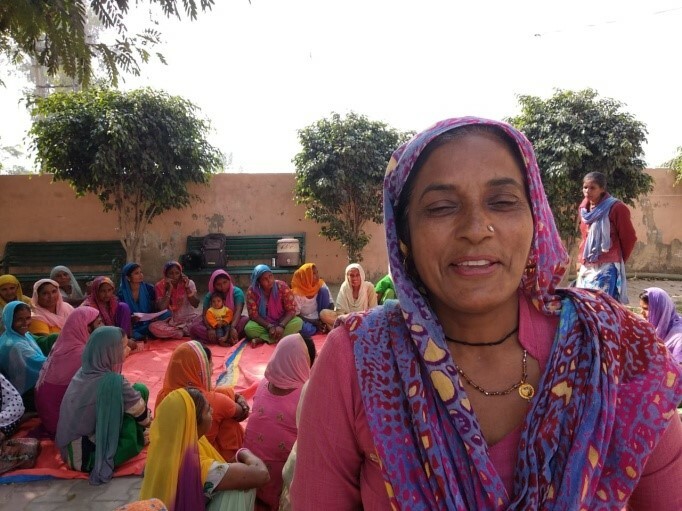 In despair, beaten and hopeless Geeta came to her maternal home in Nagla Megha. During this period (November and December) 2018, Arpana had taken up the law on domestic violence as part of the monthly SHG agenda and a workshop was organized in which Supreme Court Advocate, Mr Dayal, interacted with women advised them on rights and services provided to victims like Gita by government agencies. This workshop game Geeta hope and she shared her troubled with the District Women Protection Officer who counseled Geeta and Gopi separately, warning him of strict action if he did not change his attitude and conduct. Meanwhile, in Nagla Megha, SHG leaders had formed a core group ‘Durga vahini’ to deal with such issues. Members of Durga Vahini visited Geeta’s family in Dhakwala and had several sessions pushing forward Geeta’s perspective..Finally, Gopi also realized that an amicable resolution was the best option for him and the children. Geeta is now back with her children and husband with fresh hope in her heart for a new start. Poonam, a young women of 27 years, is a member of Vaishno Mahila SHG in village Darad. She and her husband have 3 sons. 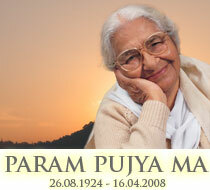 Poonam has a vibrant spirit which helps her meet adversities with a smile and a firm resolve. Satish, her husband, suffered a leg injury in an accident. Poonam then joined Vaishno group and began saving out of her daily wages. She was eager to learn and assimilated all the new information in the group. She took her first loan of Rs. 10,000 and began a fast food stall serving noodles, burgers and french-fries after learning how to make these items. Her food business flourished. Satish has joined her and the couple earns up to Rs. 700 a day and have together banished the shadow of deprivation from their door! Sangeeta is the wife of Shri Popla and belongs to the remote village of Kamalpur. She is now 40 years of age and is blessed with 2 daughters. 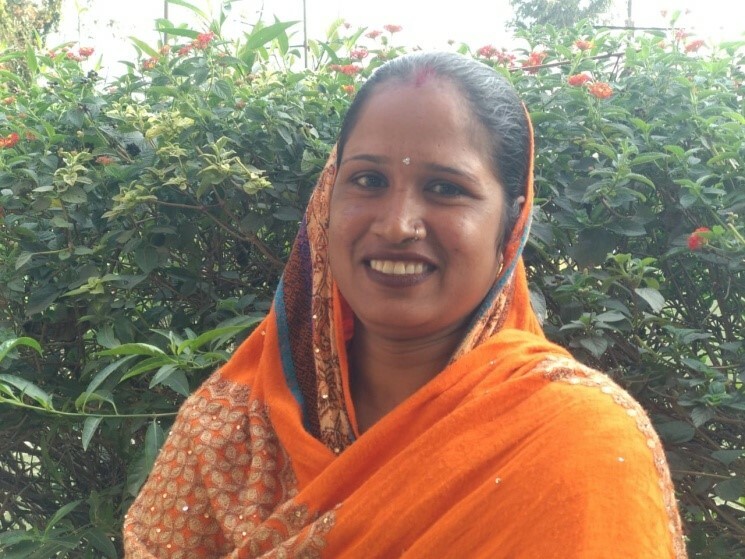 9 years ago, Sangeeta’s family was impoverished, living in a home with mud walls. Both husband and wife worked as daily labour and were usually in debt, unable to pay off the borrowed amounts. In 2009, Sangeeta joined one of the groups which Arpana formed in Village Kamalpur. She managed to save Rs. 10 to Rs. 20 each month. Gradually she increased her monthly saving. 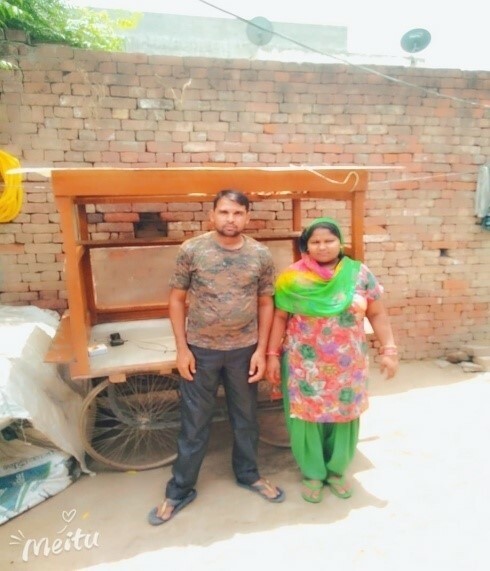 She took her first loan so that her husband could set up a mobile stall of sugarcane juice. This helped grow the family earnings. The couple worked hard and took loans to gradually make a pukka house and a shop. Sangeeta looks after the shop. 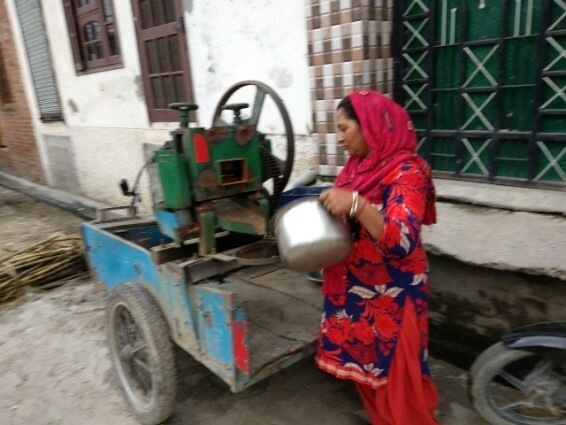 She then took a loan for a popcorn machine for her husband who now earns with the sale of popcorn and sugarcane juice. He also sells at weddings and his little business is doing well. Balwinder, son of Shri Jagdish, belongs to the village Bassi Akbarpur. He is a member of the Disabled Persons Organisation (DPO) formed by Arpana, called Naya Savera Viklangjan Samiti. Earlier his condition was not good at all. He had little income with no hope and poor living conditions. Once he became a member, he found that the new information and learning shared in the monthly meetings was very useful, for better access to government schemes and benefits. He began sharing information with other persons with disabilities (PWDs). His own medical certificate was made only after becoming a member of ‘Naya Savera’. 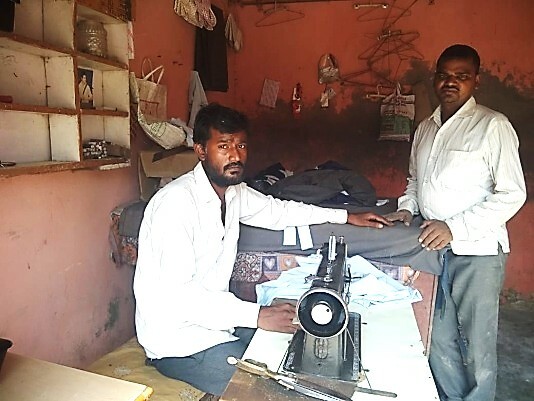 He took a loan and bought a good sewing machine and now his income from tailoring has increased from Rs.5000 a month to Rs. 15,000 a month. He is happy that he has savings and security of the DPO as a guide and a platform. Lakshman who hails from village Gadhi Khajoor, had no livelihood or source of income prior to becoming a DPO member. He can use only one leg. 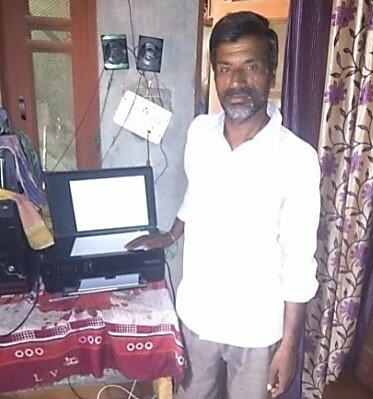 Lakshman became a member of his village Disabled Persons Organisation (DPO) and built up his savings. ‘As a member of Muskan DPO, I get information regularly. I am building my savings; my quality of life is greatly improved’ he says.